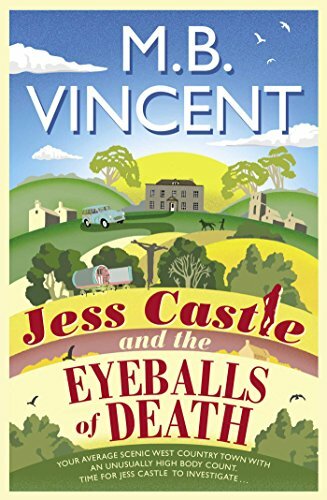 Today I am on the blog tour for Jess Castle and the Eyeballs of Death by M.B. Vincent. What a cracking title for a book! I have a What Book feature for you to enjoy today. Perfect for fans of MC Beaton, this is cosy crime at its most entertaining and enthralling. Bernie: I read broadly and voraciously as a child, resorting to reading the cornflakes packets when I was banned from bringing a book to the breakfast table. One of my favourites, a book that really revelled in story and character, was The Family From One End Street written and illustrated by Eve Garnett. Written in the 1930s, it’s the story of the Ruggles family who had seven children and no money. All human life was there. I still remember the jubilations in their tiny house when Baby William won a prize at the baby shown. Matthew: It may be my twisted mind that makes me like it so much, but the denouement of A Prayer for Owen Meany by John Irving is literally breathtaking. Throughout, Irving’s writing makes the implicit suggestion that something extraordinary awaits. Nothing, though, could have prepared me for the outcome. It’s the tale of an eccentric schoolboy who has a terrifying vision and spends the rest of his days practicing basketball dunks. The book is about accepting fate, facing fear, and fulfilling one’s own purpose. It’s funny, weird, heartbreaking, and has an ending which is awe inspiring and sickening in equal measure. Bernie: Reading Clive James’s Unreliable Memoirs was challenging as I had to keep re-reading paragraphs that made me hoot. The best compliment to give this account of the broadcaster’s early life is that Clive James writes exactly as he speaks. Matthew: I can’t think of a single book that makes me shout out loud but the genre that infuriates me is faux philosophy. These are essentially self-help books which purport to be more and are so much less. They’re usually penned by authors who have fostered a personality cult, with promising titles which pique the interest and then offer up helpings of obvious, banal, ersatz-intellectual-instant porridge. It’s middle of the road coffee table nonsense. What book has made you cry real tears? Matthew: When I was about five my dad read me Danny the Champion of the World by Roald Dahl. It’s about a young boy who’s brought up by his widowed father and discovers a dark secret when his dad doesn’t come home one night. It’s a magical book full of warm feelings about childhood and, typically for a Roald Dahl tale, full of darkness too. I’ve always thought Dahl’s writing credited children with having the capacity to see the truth, free of the falsehoods that adults inevitably create. To my mind it’s proper literature. What book has taught you the most? Bernie: I look at bees differently since reading The Bees by Laline Paul. I suspect they don’t have the intense personal lives she’s given then, but this absorbing and even thrilling tale of a hive’s fight for survival has made me feel closer to each honey bee that buzzes past my study window. Matthew: Steinbeck’s Of Mice and Men might be one of those books that men in particular relate to. It follows two migrant workers searching for work in depression era California. George, small and uneducated is brighter than Lennie who is lumbering and mentally disabled. It portrays a certain kind of male friendship where one is cleverer than the other but thinks he’s far cleverer than he really is. It deals in archetypes but it’s a genuine look at human nature and has great warmth despite its setting.